More than 47 years after his heroic actions in the nation of Laos, during the Vietnam War, Capt. Gary Michael Rose was recognized with the Medal of Honor. “This will enshrine him into the history of our nation,” said President Donald J. Trump, during the Oct. 23, 2017, Medal of Honor ceremony at the White House. During the Vietnam War, Rose served as a combat medic with the Military Assistance Command Studies and Observations Group, part of Special Forces. He was recognized for actions during a four-day period that spanned Sept. 11 through 14, 1970, in Laos. The mission he was part of, called Operation Tailwind, had for many years been classified. “Mike and his unit slashed through the dense jungle, dodged bullets, dodged explosives, dodged everything that you can dodge because they threw it all at him, and continuously returned fire as they moved deeper and deeper and deeper into enemy territory,” Trump said. That third helicopter was already damaged by enemy fire when it picked up Rose and the remainder of the fighters, and it took off with only one engine operational. Shortly after lifting off, its remaining engine failed, meaning the aircraft would have to be “auto-rotated” to the ground. On board that aircraft was an injured marine door gunner who had been shot through the neck and was bleeding profusely. As the helicopter pilots attempted to bring a helicopter with no power safely to the ground, Rose tended to that young marine’s neck – saving his life. “Mike was thrown off the aircraft before it hit the ground, but he raced back to the crash site and pulled one man after another out of the smoking and smoldering helicopter as it spewed jet fuel from its ruptured tanks,” Trump said. At the White House for the event were members of Rose’s family, including his wife, Margaret, his three children, and two grand-children, and nine previous Medal of Honor recipients. After speaking, Trump placed the Medal of Honor around Rose’s neck. 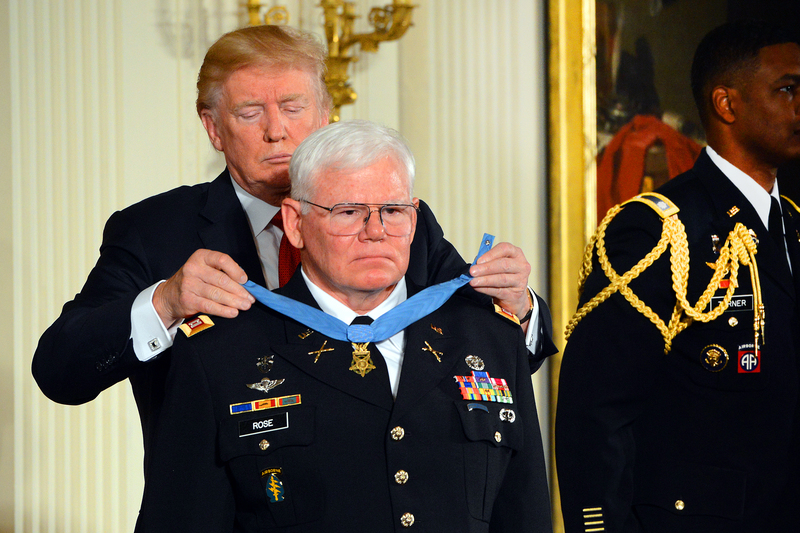 Following the Medal of Honor ceremony, Rose said he believed the medal he’d been awarded was not only for him, but for all those who served – especially those who had fought in combat but who had not been able to be recognized due to the classified nature of their operations. “This award, which I consider a collective medal, is for all of the men, to include the Air Force and the marines who helped us,” Rose said. “This is our medal. We all earned it. And to a great extent, it is for all the men who fought for those seven years in MACV-SOG, and even further than that, for all the Special Forces groups who fought and died in that war. “In honor of all those individuals that went for so many years, when the military didn’t recognize the fact that MACV-SOG even existed, and all of those men that fought – this kind of brings it home. And now our story has been told, and now with this award I am convinced that they have been recognized for the great service they provided to this country.